TileREX – Professional Engineering Co., Inc.
Watch the tool in action! In 1999, Armstrong Ceilings introduced the industry’s first ceiling recycling program. 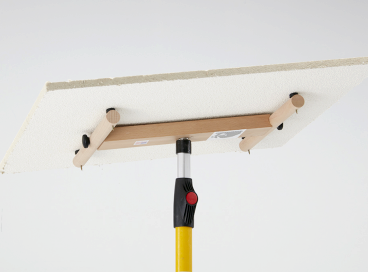 Armstrong’s program requires that the contractor palletize their ceiling tiles – and in most cases tiles that are removed break into pieces making it nearly impossible. The TileREX tool was designed to solve this problem! TileREX™ can not only remove the ceiling tiles from the suspension grid whole without breaking them, making palletizing easy but it can also be used from the floor increasing productivity and keeping your workers safe.